I love an easy recipe. Extra points if it's healthy. This is one of those box checking recipes that is not only easy, but healthy, inadvertently vegetarian and gluten-free as well as having the possibility of being vegan. I KNOW, right?! 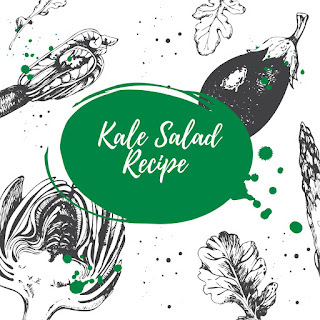 THIS KALE SALAD TASTES PHENOMENAL WHEN HEATED! Additionally, this is one of those recipes that you can add into your weekly meal prep rotation and enjoy all week, IF, (and this is a big IF) you can keep yourself from eating it within a day, which, in my house, we can't. Also, any of the ingredients in this salad are merely suggestions. If you prefer rice in place of quinoa, go for it. If you've got green onions on hand, throw them in! Fan of dried cranberries or cherries, by all means, DO IT! 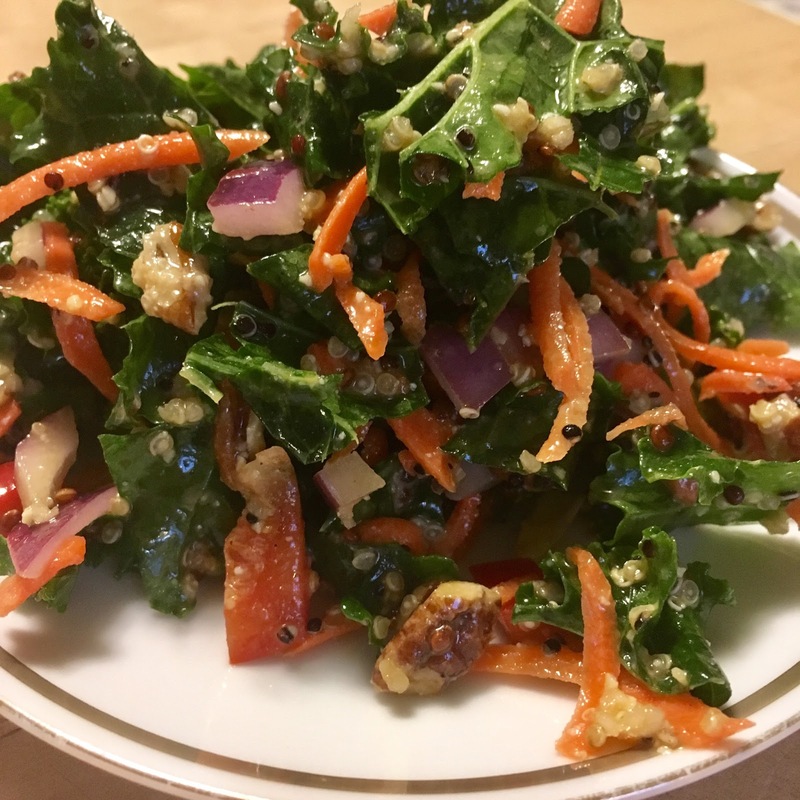 This is a recipe you can continually switch up with new ingredients, or just use to clear out the veggies in your fridge at the end of the week! All of that, and you can shovel this delicious salad into your gob with zero guilt. What's not to love? Now, I like to buy the pre-washed big ol' bag of kale in the store, but I don't want to tell you how to live, so you can buy whatever kale you love best. My mother-in-law recently purchased purple kale and said it was miles above regular ole green kale. And, when it comes to the dressing, I kept it simple with olive oil and vinegar, but if I had lemons I would have squeezed them in too. Heck, an orange would also give it a zing. This is a salad you can take citrus risks with. So don't hold back--just taste as you go! Lastly, I want to take a moment to build the tension and wax on the beauty of the colors in this exquisitely beautiful salad. Ever heard the phrase "eat the rainbow" when it comes to veggies? It can be easier said than done, but I feel so good when I can cram a bunch of colors into a dish. I mean, just beautiful amiright? Of course I am. I'm always right. I'm the rightest McRighterson that ever lived. That's why you came here--for my rightness and my recipes. Or at least my recipes, right? Right I am. Handful of nuts, your choice, I like pecans, pine nuts, walnuts or slivered almonds. You're going to spend most of the time on this recipe chopping, dicing and slicing and then basically throwing everything in. It's your call whether you like to add as you go, or to prep everything ahead of time and add all at once. The only consideration you'll want to make is for the quinoa, which you will want to have cooled slightly. Start by filling your gigantic bowl about 3/4 full with your kale. Remove any large stems from your kale, and if you wish, tear it into smaller pieces with your hands. Add all of your veggies to your bowl and then mince the garlic into the bowl. Add your parmesan (if using) and then begin adding the vinegar and oil. What I like to do for the dressing is go a few times around the bowl, pouring as I go, first with the oil and then with the vinegar. This would be a fine time to add your citrus juice, if using, too. Then give the whole big bowl and big toss, taste and add salt and pepper. Repeat the process with the oil and vinegar until you've reached a balance that is good for you. This is the point where I like to call my husband in and say "hey can you taste this--does it need anything?" And then we taste and add and taste and add and basically we are just eating and it's delicious. If your bowl has a lid, it's also great to put the lid on and give the whole thing a good shaking!! Store in the fridge. Serve as a side to practically anything OR throw it in a bowl and pop it in the microwave for about a minute or two and enjoy hot! Mmmmmm. So good. 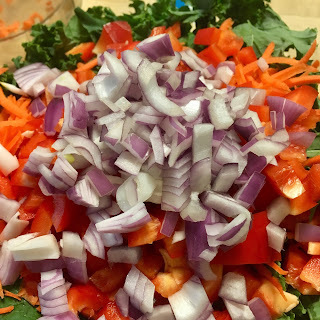 *I will not say "red onion" because the onions are not, in fact, red they are PURPLE. I even did a not-even-close-to scientific Instagram poll which confirmed by visual hypothesis that these onions are not RED as originally named. So hitherto and therefore, such onions will only be referred to as purple herein. And whatnot.